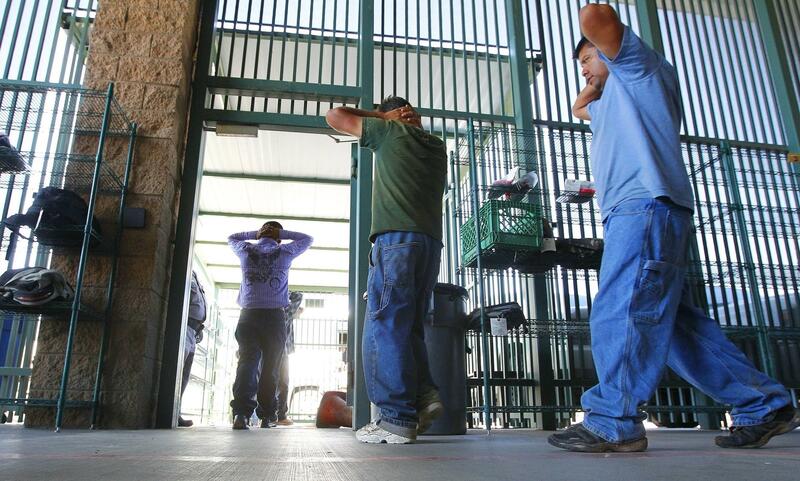 Immigrants suspected of being in the U.S. illegally are transferred to be processed at the Tucson sector of the U.S. Customs and Border Protection headquarters in Arizona in 2016. The case, Jennings v. Rodriguez, has implications for legal permanent residents whom the government wants to deport because they committed crimes and for asylum seekers who are awaiting a court date after turning themselves in at the border. Immigrant advocates contend that many of these immigrants have a right to be free on bail until their case is heard. The decision reversed a Ninth Circuit ruling, but this is not the last word and could come back to the high court. The Supreme Court sent the case the back to the lower court with two questions unresolved. First, whether indefinite detention without a chance for bail is unconstitutional. Second, whether the challenge to that no-bail provision can be brought as a class action, instead of as individual cases. Stanford Law professor Lucas Guttentag says that in practical terms, the class action question is enormously important because most of the immigrants affected by Tuesday's decision don't have lawyers. "If they're required to proceed individually, many of them will never be able to pursue their claims," he says. "A class action provides protection to everyone, not just to those who have a lawyer who can file a lawsuit." On Tuesday, Justice Stephen G. Breyer read from his dissent, a rare move for the court and an indication of just how passionately he disagrees with the majority opinion. "We need only recall the words of the Declaration of Independence," Breyer said, "in particular its insistence that all men and women have 'certain unalienable Rights,' and that among them is the right to 'Liberty.' "
The American Civil Liberties Union took up Rodriguez's case. The civil rights group filed a class action lawsuit and eventually won his release and the cancellation of his deportation order. Rodriguez remains in the United States. The Ninth Circuit Court of Appeals ruled that the immigrant detainees and asylum seekers can't be detained indefinitely and that they have a right to a bond hearing every six months. The appellate court also held that in order to hold these detainees, the government must show that the immigrants would pose a danger or become a flight risk if set free. The administration also argued that detained immigrants should not be recognized as a class that could bring legal action. Lawyers for the Justice Department said detainees should rely on individual habeas corpus petitions to challenge their detentions. The ACLU countered that few detainees have access to legal counsel and that a backlog of such habeas corpus petitions almost guarantees delays in winning release.